Hello everyone! My name is Yume. I’m 23 years old and a graduate student. I like hanging out with foreign people. Since I began guiding foreign people in 2015, I have already held my activities over 30 times! I’ll value these encounter. - Places you want to go! - You can go places you want to go. - I go to pick you up at your hotel or station you specified for free. - I make our schedule through exchanging messages. Come hangout around Akihabara and Nakano, and visit many anime shops with me! Fantastic time with Yume - super flexible with itinerary and super good recommendations regarding shops of interest. Highly recommended. Yume was a great host for our day around Tokyo. 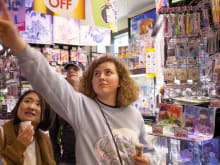 Before the tour she asked what anime/Japanese pop culture I was most interested, and then she sent back a detailed schedule on shops that did or would have most likely carried said goods. She also worked in lunch for a themed bar I wanted to go to. We visited major anime sections of Tokyo like Shinjuku, Ikebukuro, and more and walked around the shops. She really knows her stuff for second hand good shops, bookstores, videogame stores, etc! Yume is also incredibly helpful in translation. She helped me identify a lot of items I had previously seen, but didn't know what they were. She asked store clerks for certain items for me, which I really appreciated. And she navigated the menu during lunch! Overall, 10/10 experience. If I had tried to visit these shops by myself I wouldn't have hit 80% of them. This is the tour for anime shopping. I recommend it if you are looking for anime/gaming merchandise. I loved the time I spent with Yume. She is a very good guide. We went so many places that I would have never found on my own. I took alot of photos and bought some cool stuff. I enjoyed lunch very much. Yume took me to her favorite place to eat Ramen. I ordered the meal she suggested and it was great. At the end Yume gave me a gift of some Japanese snacks. If you love anime new and old you'll like this tour. It was the best thing we did! Yume was incredibly nice and patient, and she helped us a lot! She showed us amazing places, and we are really thankful for her. She also did her best to bend the itinerary as per our requests, and we enjoyed as much as we could. Amazing! Yume is the best!! So willing to make the "Hangout" customized to the anime we wanted to see. Very positive, friendly and supportive. Maid Cafe... Owl Cafe... lots of shops... Great little noodle place for lunch. Lots of FUN! Absolutely would recommend Yume to everyone!